Google has not had the best of luck when it comes to TV, but its last effort, Chromecast was a roaring success. The $35 HDMI dongle found itself outselling just about everything else out there. It is an excellent and affordable way to bring extra content to a family’s entertainment portfolio. There are no “official” specifications for Android TV at this time, and we are certain they will change since Android TV is still in development and will not be available for sale until later this year. Physically, Android TV is a small little box, less than half the size of a common household router, and even small when compared to other content and entertainment systems like Xbox One and Sony PlayStation. Getting into the user experience, it is fast and fluid. It follows on the strengths of Google Play when browsing for content, and it is easy to navigate through all the features and apps. The controller we used for the hands-on looks like a gaming controller, but like Android TV, it too may change as things develop. When the final product does make it to market however, it will have a number of applications ready to deliver content beyond the Play store. Netflix, Songza, YouTube, TuneIn, and the rest of the usual suspects already have their apps ready for you to acquire the moment you take Android TV out of the box. 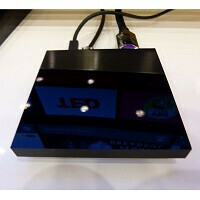 For any one of the billion Android users on planet earth, diving into Android TV will be instantly familiar. We did not get into any game play because the volume on the TV was being finicky and it was requested that we keep the volume down. We have no reason to doubt the quality of gameplay however. There is no information about how Android TV will be priced, or when it will be available. However, given that there are no mechanical systems on board that entertainment boxes like the Xbox One or Sony PlayStation have to allow DVD or disc-based game loading, we expect Android TV’s price point to be well below those systems. ny word on HDMI passthough? You mean sources like Apptoide etc, so mean cracked apps, so that means stealing. Im sorry but that is kind of stealing. If you buy a sony phone you'll get the sony apps. If you don't sony won't give it to you cause they made it and aren't selling it on the market or anywhere else(if im correct). They only give it on their own products. Same with samsung/lg/htc etc. This is nothing but a typical streaming box with gaming. There is nothing revolutionary at all. The general public will see this as the same crap that's been available for years. Speaking of crap, sounds like someone needs a diaper change. That's one titanic rash. Can't wait to buy it and download a Windows 8 launcher. At first I thought is was an os for tv. Apple TV Android TV Whats next Windows TV? Ahhh for that to make sense Apple TV would have to be called iOS TV. Or you would have to have Google TV (Which launched back in 2010) and instead of Windows TV it would need to be called Microsoft TV. But yeah okay troll more. Yet everyone on this site always refers to "Android vs Apple". Hmmm…yea, tables turn when you want them to, Mr. Google. Stop getting upset and offended. It was just a general statement. If you feel trolled, Im sorry. That blue light makes it look like what the PS5 make look like. Google need to persuade partners like Samsung, Sony and LG to make TV using this OS to deliver content. No an easy task as each has already used to their own TV OS. LG has webOS, Samsung and Sony has some in house custom software. Won't happen, and you know it. LG will use WebOS, Samsung using Tizen. All Samsung TV's will come with Tizen in future now (confirmed news). There goes the 2 biggest names in TV. Only Sony "might" be an option. Actually LG has used Google with their TV's in the past. (LG 55GA7900) If this takes off well I could see LG going back to them unless webOS gets some major support. Sony was the first to carry Google TV while it was basically beta.